Like the quote above, most people including me choose the wrong life choice. I always spend the money first, buy things, hang out and after all of them have been satisfied finally I put some money for saving. This become my habit since in high school. At that time, my parents always give weekly "salary". Not the real salary, but pocket money. At the college, it was getting worst because my parents gave me monthly pocket money like regular working people got transferred every month. The only different thing was mine was transferred at the early of month, not like the regular worker. Although it was getting worst, indeed I could save more money because I had another income at the time. When I started to work few years ago, my bad habit was not changed. Spending first, save later. Save what is left after I satisfied spend it by bought new gadget, hang out, etc... Lately I start to change my habit. 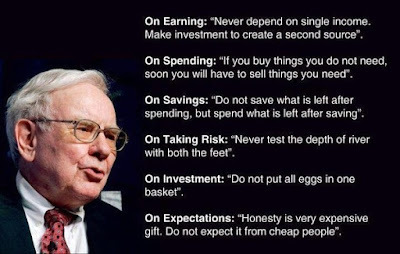 I start to follow my girlfriend advice to save the money at the moment I receive the money, exactly like the quote from Warren Buffett.